To experience Thailand's capital and most populous city, compare cheap flights to Bangkok and see what memories it can hold for you; it has something to offer every kind of traveller which presents itself as a once in a lifetime experience. With over 400 temples, known locally as 'Wats', it's no surprise that it has been nicknamed 'Temple City'. Whilst you could fill your days visiting these in abundance, be sure to also make a trip to Wat Pra Kaew and Wat Arun, located in and around the Grand Palace formerly a place of royal residence. If history is your thing, immerse yourself further and take a trip to Bangkok's National Museum. 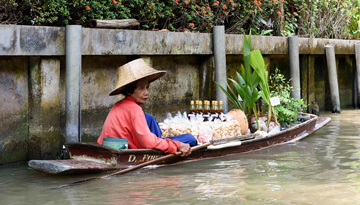 Visit a floating market offering everything from food to souvenirs; Khlong Lat Mayom & Thailing Chan are amongst the most famous and are worth a visit. Witness the livelier scene of Bangkok you so often hear about when you visit the world's largest China Town or Khao San Road - a hotspot for travellers and with good reason. Offering entertainment into the early hours, bars, shopping, street food and international restaurants, this is a one stop shop for an exciting time in the city. You can also make your way around easily thanks to their well-connected transport systems including the metro, buses, boats and of course the famous Tuk-Tuks that can easily transport you around the city. Bangkok offers more than just attractions, you'll find the chance to make lifelong memories with Compare and Fly offering access to cheap flights to Bangkok all year round. Known locally as 'Krung Thep', translating to "the City of Angels" – a place of royal palaces where reincarnated angles reside. Invested in their monarchy, the King deserves full honour and a big cultural no-no is going against this. If you talk respectfully of the King and never step on a coin with him on it, you're welcome in their friendly culture. From street food and markets to quality restaurants, the Thai food scene is internationally appreciated, improved only with the authenticity of trying it in its country of origin. Order Pad Thai or spice it up with Thai curry and Jasmine rice! Recognised as one of the world's hottest cities with temperatures averaging at 31°C, you can visit the city at any time of year to appreciate the heat. It is worth noting that Thailand has a tropical monsoon climate, with the hot season spanning March – June and the rainy season July – October and November – February, resulting in slightly cooler temperatures. December marks the coldest month, which still averages highs of 26°C. For incredible weather, food and truly unique experiences, this city should be top of your travel list, so find cheap flights to Bangkok today and join the other travellers making the most of this diverse culture. ebookers.com offers Turkish Airlines flight from £328, Fly now from London to Bangkok at cheap price. 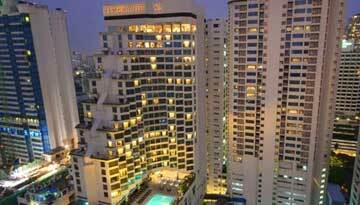 Rembrandt Towers Bangkok offers luxury and outstanding service to keep the valuable guest. 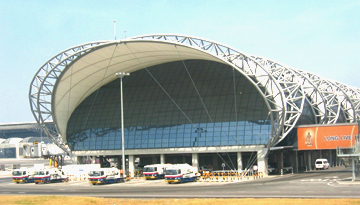 Flight from Gatwick - Bangkok & Stay for 5 nights with 5 star accommodation. Include Bed & Breakfast.